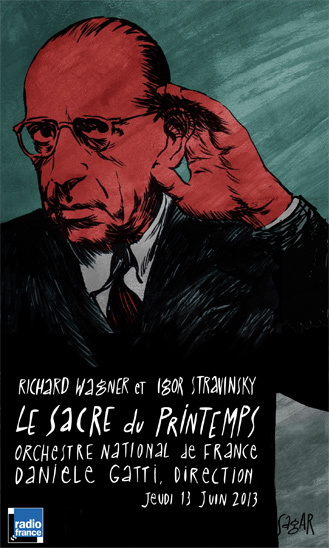 Stravinsky's "Le Sacre du Printemps"
The original ballet of The Rite of Spring shows the ritual of a pagan tribe asking for the spring to return. The ceremony finishes when the tribe obliges a young virgin to dance until she dies from exhaustion. A community's member in exchange for the spring: a human life in exchange for more life. Based in this main idea, Sagar Fornies illustrates a panoramic journey through the evolution of the Humanity and the Earth. In the first half, the slow entrance of the bassoon of the Orchestra is the backdrop to show an Earth in the middle of her creation process and expansion. Infinite landscapes, peaceful seas, spontaneous forests...an ancestral Earth in an everlasting spring. This is the context in which the Humanity appears...almost hidden. In the second half, the landscape changes, it is manipulated; the Earth is transformed, each part starts making sense; everything is used, interpreted and organized. Humanity colonises forests, plains, meadows and skies. The Earth is not an actor anymore but a simple scenario. Finally the Earth, following an atavistic force, claims for her spring. The sacrifice starts and the humanity dies from exhaustion, like the tribe's young virgin. Her ending is a new beginning. Everything ends just as it started. Earth moves on. Sagar Fornies invites us to think about our place in the evolution of the Earth, the metaphor of sacrifice, and about the urge to die in order to revive.